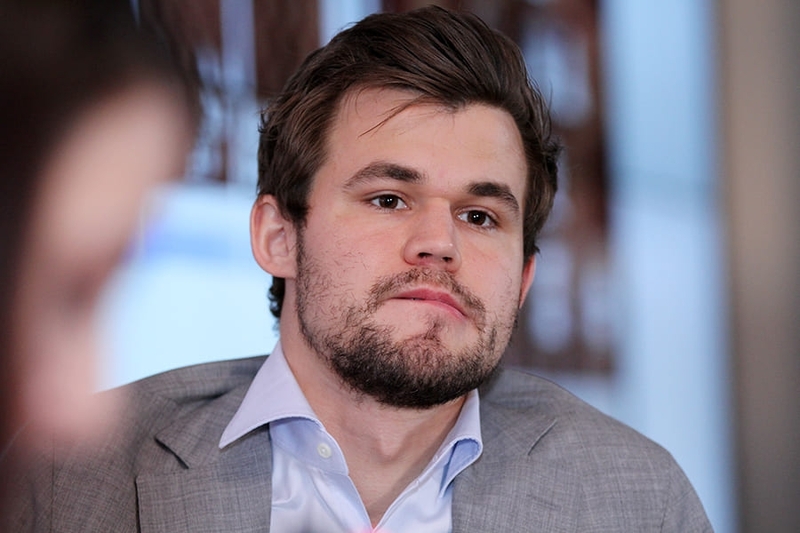 Magnus Carlsen has won the 2019 Gashimov Memorial in Shamkir with a round to spare after winning a flawless game with Black against Sergey Karjakin in Round 8. “It’s been a great ride”, said the World Champion, after a second game in a row played in what he called an “interesting dynamic attacking style”. 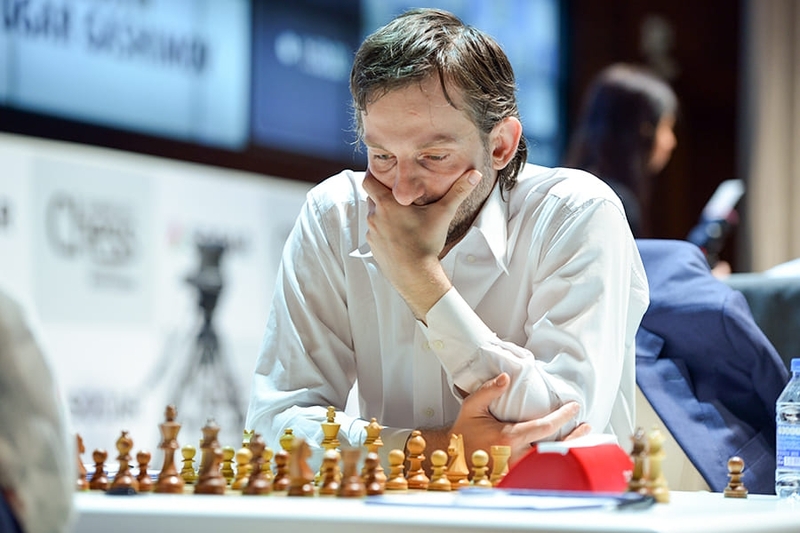 That meant that although Alexander Grischuk and Ding Liren beat David Navara and Veselin Topalov respectively to join Sergey in 2nd place they can no longer challenge for the top prize. 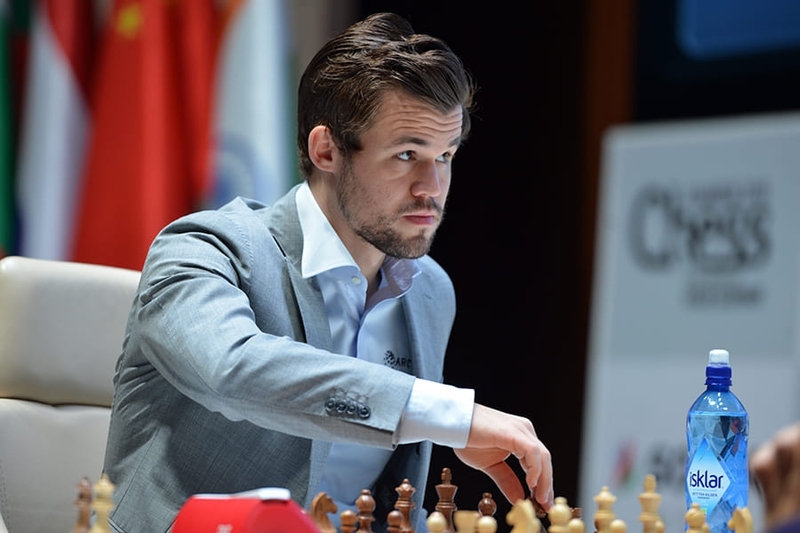 Magnus Carlsen’s record in Shamkir Chess is now played four, won four, and this year’s victory couldn’t have been more impressive. The win against Anish Giri in Round 7 looked hard to top, but Magnus noted, “I was a little bit upset that I didn’t manage to finish it off in the right way”. He was referring to his going for an ending just when he could have crashed through tactically, but in Round 8 he showed absolutely no mercy to his opponent. Last time against Navara I played Nb8, but I decided to switch it up here. I think [Sergey] was a bit surprised by my choice, since I hadn’t gone for this particular line since the 12th game of the match with Caruana. Considering the time trouble he got later in the game it was a wise choice to repeat early on. Obviously with the tournament situation I didn’t mind a draw early on. 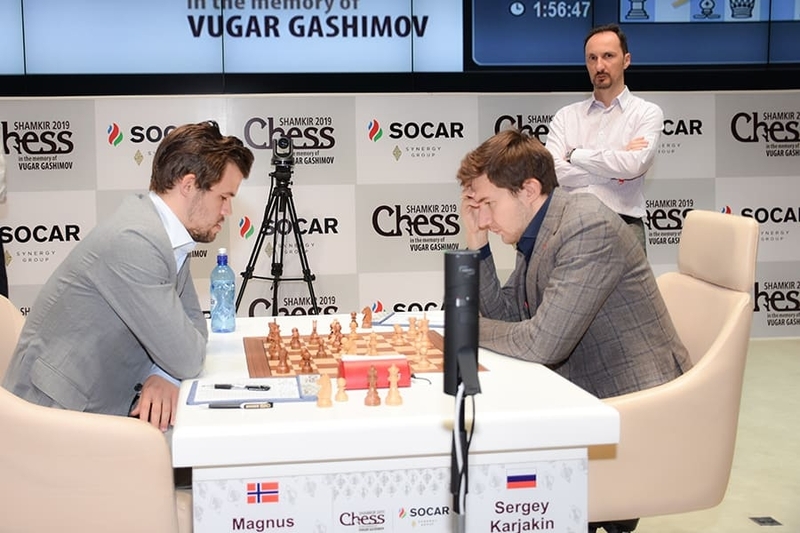 I think you can see that the game today was a special case because Sergey needed to win, so he played riskily, which allowed me to use my strengths in kind of an open battle, and in World Championships I’ve gotten the chance to do that less often, so I think that’s one of the reasons. When people take more risks it becomes more open and it’s good for me. Obviously you have to play well, you have to play good moves, but I think when looking at the games with computers it’s hard to understand what’s actually going on in the minds of the players. When I look at chess I try to look as little as possible with the computer, because I know that once we get past the preparation phase then it’s not really relevant what the computer says and it’s more about psychology and everything. This particular opening is a typical case. If you turn on the computer early on it will say that White is better, but it doesn’t say whether the position is easier to play for White or Black. Once he got out of the opening then it feels like, yeah, he’s a pawn up, but it feels like the stakes are kind of higher for him. I’m going for mate, and he has to survive. Yeah, I think psychology is definitely a huge part of the game. It’s one of the reasons why this particular line is doing well. I wanted to keep the initiative and I liked 25…c4 – I could also play b5, forcing him to go into this pin, but I wasn’t so sure. I thought it would be better to have the pawn on c4. Here I think he should definitely play 26.Qc2. It looks strange to pin himself, but I don’t think there was a better choice. I was intending Re8… I thought I had excellent compensation, but it’s still a tense position. I think 26.Nc3?! is a mistake, and he just underestimated my plan. As far as I could judge from his body language he was resigned to a draw at this point. 28.Na4 is very, very ugly, because it’s quite likely that this knight will never move again – that’s what happened in the game. I’m sure it was his best chance, because after 30.f4 he’s more or less just busted. He’s not down material, but the difference in strength of the pieces is just too massive. 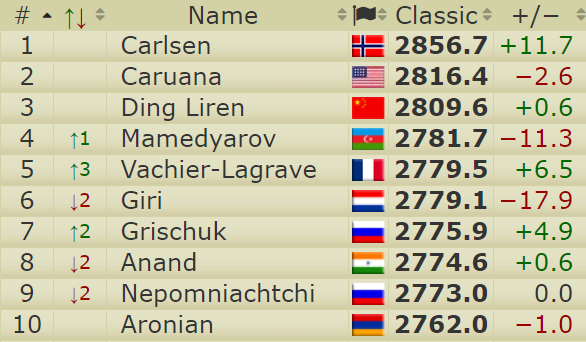 And that result took him to 2856.7 on the live rating list, over 40 points ahead of Caruana and matching a certain Garry Kasparov’s highest ever live rating. These are rarefied heights! Magnus stayed around for a long time after the game answering questions from Eteri Kublashvili and journalists, and there was a lot to enjoy. I thought today’s game, I don’t know if it was very good, but it was at least very interesting, and the game yesterday was interesting as well against Anish, although I was a little bit upset that I didn’t manage to finish it off in the right way. Certainly the last two games have been fun. I’ve been able to win or at least to play in an interesting dynamic attacking style. It’s not the way I usually win games, so it’s been a lot of fun frankly, the last two days – it’s been a great ride! I think there’s certainly a difference in style. I definitely play differently now than I did then. I think I know a lot more about chess than I did five years ago. I was higher rated then, so the evidence doesn’t suggest that I’m a better player now, but I feel like I know more, and I can do more, and I have more options. I have a wider array of weapons than I did back then. There are many. Wei Yi was tipped to be the next big thing, and he could still be it, so I don’t know. I’m mostly concerned with those I play in the top tournaments, but I think they’re both wonderful talents and already great players. It’s funny that Alireza actually came here to the first Shamkir tournament as a fan and now he’s the next big thing, so I’m happy for him, and Artemiev as well is a very original, interesting player and we’ll see how far he can go, but I don’t feel the threat anytime yet. 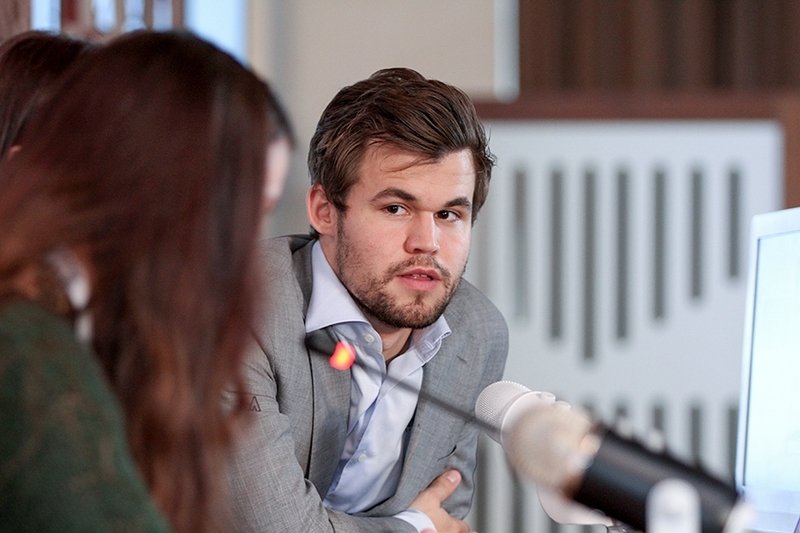 Are we living in the Carlsen era? I think we have already for a few years already, frankly, so yeah! I’m playing in Germany just in one and a half weeks from now, so it’s going to be very little rest, but it’s good. When you have a good result you want to keep going! Regarding the tournament I’m of course deeply upset about the result in the Karjakin-Carlsen game, as now it kills the dream for me and I have no chances to win the tournament. I just became tired towards the end of the tournament – I started miscalculating… I just spent too much time and just missed some ideas. The knight on h6 jumped to g4 and was then sacrificed on f2, but despite some complications Navara only gained a rook for two minor pieces, which proved insufficient. The two draws in Round 8 can be passed over with little comment. 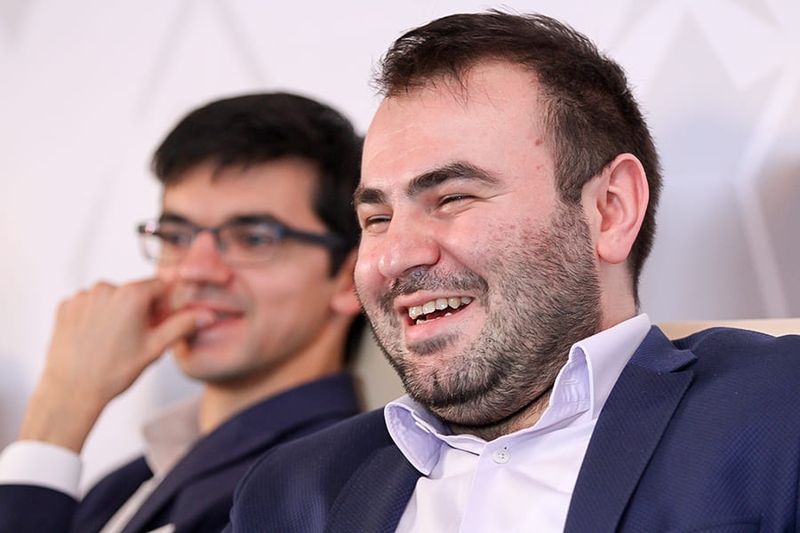 Radjabov-Anand was a dry 33-move draw that never threatened to be anything else, while Giri-Mamedyarov was a messy encounter between the tournament’s two out-of-form players. Anish joked in the post-game press conference that the lines Shak was showing demonstrated how badly they were both doing, with a draw ultimately a fair result. 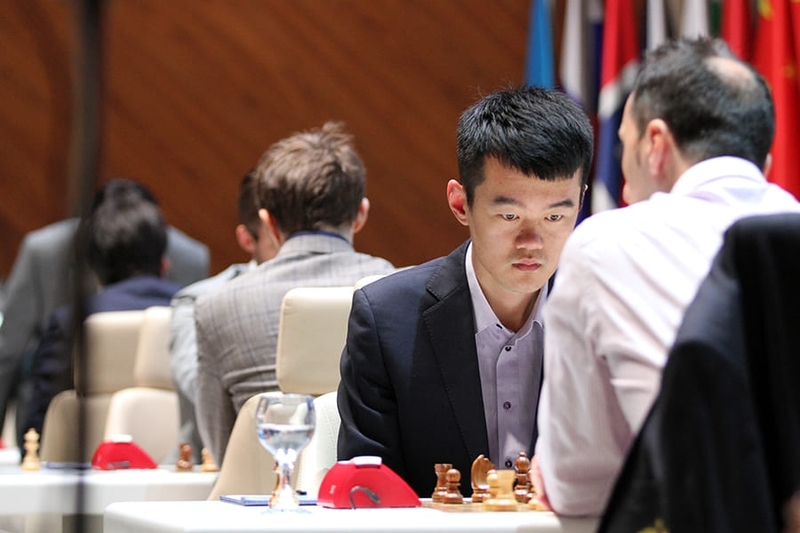 Ding Liren perhaps has the best chance of claiming clear second place, since he has White against Giri, while Karjakin is Black against his friend Mamedyarov and Grischuk is, as we mentioned, Black against Carlsen. 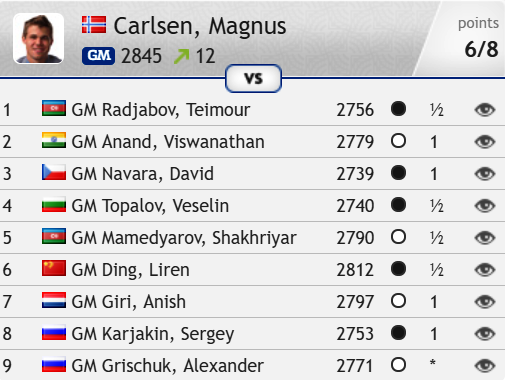 It remains to be seen if Magnus will go all-out to match his best Shamkir performance and perhaps hit 2860 on the live rating list. During the Carlsen-Caruana commentary Grischuk talked about how games against the World Champion are special for him and he doesn’t understand the approach of those who are just happy if they can get an uneventful draw. Tune in to all the action from 12:00 CET - one hour earlier than usual! - live here on chess24!